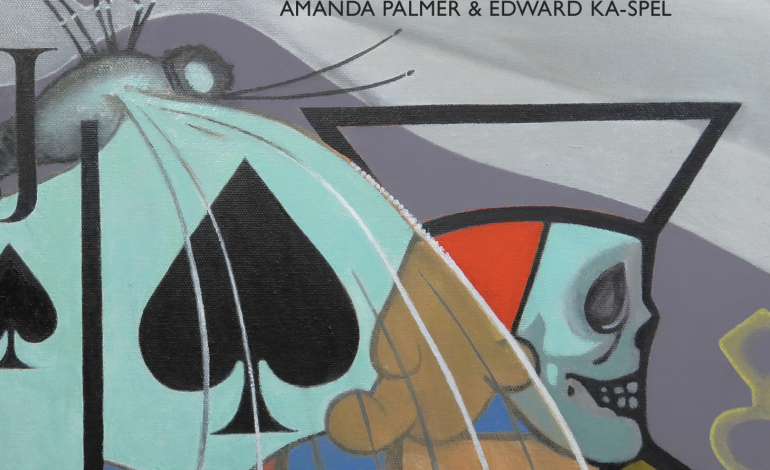 Amanda Palmer and Edward Ka-Spel’s I Can Spin A Rainbow is an album that takes on the life of a deft performance art piece. It can only be listened to in certain ways; it’s not something that one throws on at a party, or in their car. There is a sense of ominous emptiness, mixed with small instances of hope that wash over the listener like a rising tide. Depressing, intrinsic and exhaustively profound, Palmer and Ka-Spel put together one of the strangest experimental albums of the year. I Can Spin A Rainbow is a mixture of strained piano and subdued acoustic guitars, coupled with a peculiar brand of electronic music that doesn’t derive from anything out of mainstream — or even underground — scene. In truth, none of the album really fits all that well together, because each song is like a Jackson Pollock painting. It’s pretty and difficult to make sense of, making it largely subjective. Sometimes it feels like the listener is neck deep in quicksand. Sometimes it feels like each song is a separate movie scene. The highs and lows are so drastic that it feels like Ka-Spel and Palmer are dragging the listener out of their house in the middle of a torrential downpour. Some songs are spoken word, some are uttered in a dangerously harrowing whisper. The overall effect is beautifully haunting, and it works. Palmer and Ka-Spel pumped out some seriously heavy poetry, and hearing it stripped down is incredibly powerful. Songs that especially stick out are “Shahla’s Missing Page,” “Beyond the Beach” and “The Clock at the Back of the Cage,” which have unofficial music videos on YouTube, uploaded by Palmer herself. “The Clock at the Back of the Cage” details the painful steps of some downfall — heartbreak, or any angst. The characters depicted in this song are walking with us in a desperate attempt to be alive. The whole album feels like it is a fight between life and death. It feels like many of the situations in the songs could be equated to walking along a circus tightrope in front of an audience. “Beyond the Beach” is one of the shortest songs, and it’s one of the weirdest, yet easily acceptable, to hear. It offers pleasant background music for getting one’s work done and is reminiscent of Death Cab For Cutie, but on LSD. The slow opening transitions well into Palmer’s monotone voice. When Ka-Spel jumps in on the chorus, the song gets darker, as if the listener’s ears have been dunked in murky water. Once again, a haunting piano serves as the catalyst between the two as they duet. Then, it comes to a sudden and anticlimactic end. However, it still leaves listeners wanting more of the song and the feeling that it had concocted. One track that really reaches into another realm is the first track, “Pulp Fiction.” This is one where the off-tempo electronic sounds start to clash with Palmer’s spoken word. The suspenseful beginning might be a bit of a stretch, but the song still is a pretty good representation of what a listener should expect on the album. I Can Spin A Rainbow would be an amazing indie movie soundtrack. It’s a goodie for lovers of The Dresden Dolls and The Legendary Pink Dots, and for fans of abstract, experimental and out-there art. It’s 20 years in the making, and Palmer and Ka-Spel definitely delivered.